I recently stayed at Hotel Jen Manila and just like my previous stays, I ended up enjoying the entire staycation more than I thought I would. This got me thinking that in my experience, it is always the case when it comes to Hotel Jen Manila. I only expect to have a decent stay, and it always gives me memorable ones. Take for example the first time I blogged about Hotel Jen Manila. I stayed there because I needed to get some work done and there was really no intention of blogging about it. Yet, I ended up doing so because the stay ended up like a leisurely staycation while getting my work done. This particular visit when I was hosted by the kindly people of Hotel Jen Manila, I really intend on blogging about. 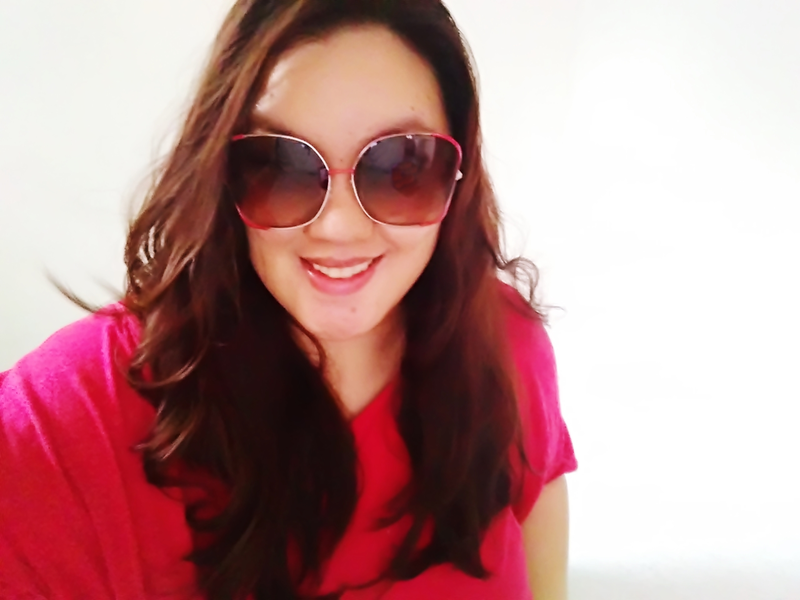 Taking into consideration all of my previous stays of which were all personal trips with family and friends and completely not related to blogging, I figured those good experiences merits to be taken into account. So instead of the usual staycation blog post I am used to writing about here on the blog, I will resort to listing format instead. It is no secret that Hotel Jen brand is under the sturdy helm of Shangri-La Hotels & Resorts Group. And this group, as we all know, is known for their impeccable quality service in that league. So, yeah. Knowing that Hotel Jen is of Shangri-La group gave me that secure feeling that guests such a myself will be well-taken care for. Hotel Jen Manila is located along Roxas Boulevard in Manila. It is 20-minute drive away from international and domestic airport, with an easy access to NAIA Expressway. Makati Business District is only a mere 20-minute drive while the entertainment district of Malate is just a short walk away. Basically, its location is a good spot since it is near to almost everything one might want to visit while in Manila. You might want to check out the Manila City Guide video posted at Hotel Jen Manila’s website for some inspiration. 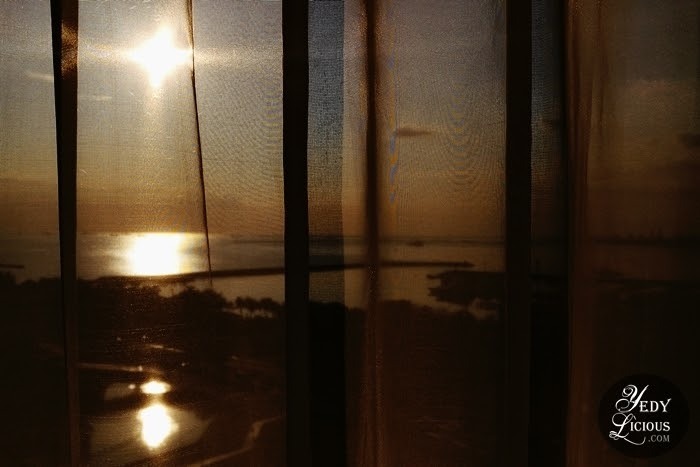 If you are like me, who live for the magnificent beauty of the Golden Hour and is mad crazy about sunset, Hotel Jen Manila, is one of the best spots to enjoy such breathtaking sight. I Have been lucky to have stayed in rooms that gave me access to beautiful sunset view but I am not sure if that is the case in all of the rooms at Hotel Jen. But the best possible spot that you can experience it as their Club Lounge. Imagine watching the sunset while enjoying cocktails and unlimited light bites? That’s one of the many things that Hotel Jen’s Club Lounge can offer you. 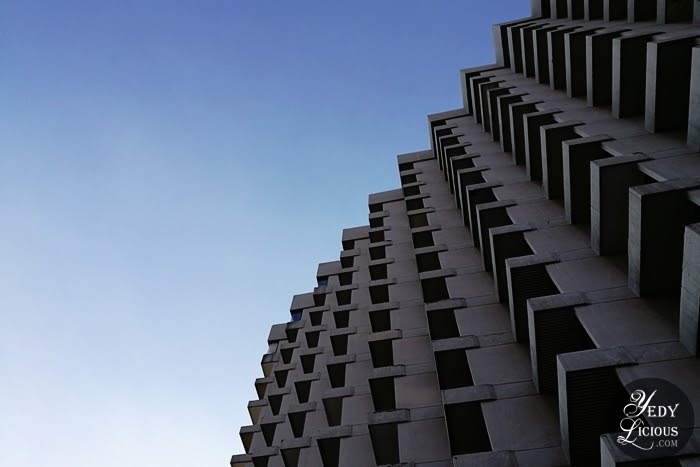 It is a general knowledge that the hotel has undergone several transitions all through the years before it was branded as Hotel Jen Manila last 2014. Since its structure goes from way back, the rooms are designed just like the way they designed hotel rooms before – with big floor area. 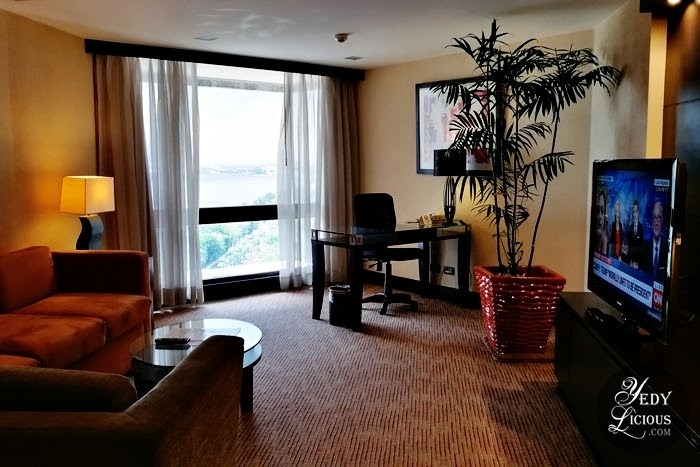 Every time that I stay at Hotel Jen Manila, I make it a point to avail of the rooms that will give me access to the Club Lounge such as the Club Rooms and the Suites. It features all the necessary stuff that I want in a hotel room and the Club Lounge access is the proverbial icing on top of the cake. For my recent stay, I was assigned a spacious Executive Suite which I enjoyed immensely. For a complete hotel staycation experience, I am one of those who are after the hotel amenities. 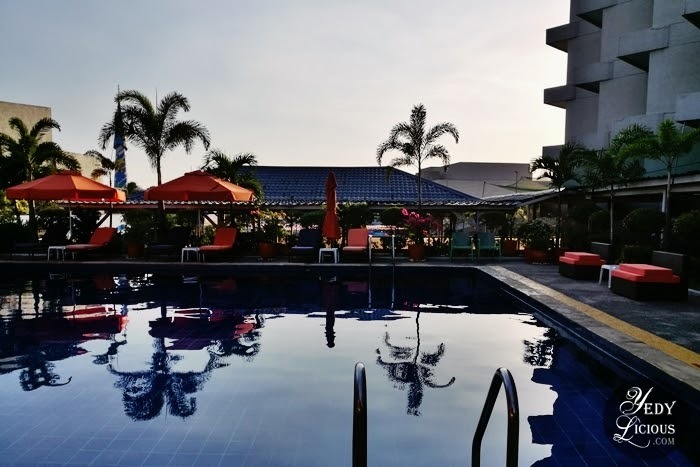 Hotel Jen Manila, aside from is impressive restaurant selections, features a 24-hour fitness center for those who does not want to skip their gym time and an outdoor pool which is a perfect venue for leisurely time with family and loved ones especially this summer. 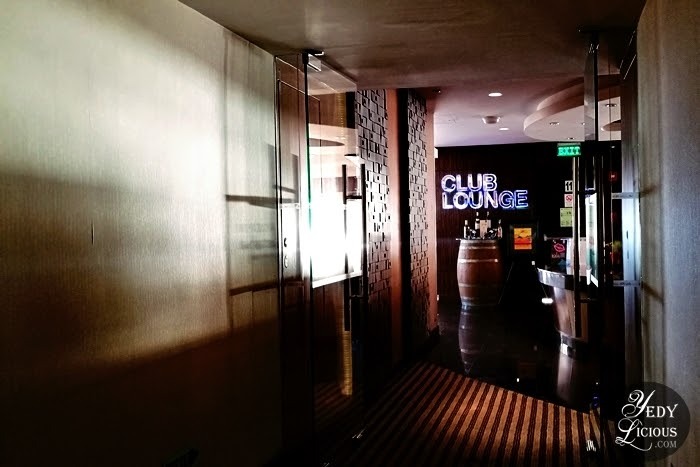 I firmly believe that it is highly recommended to book a room that will grant you access to Hotel Jen Manila’s Club Lounge because it makes the experience well worth it. 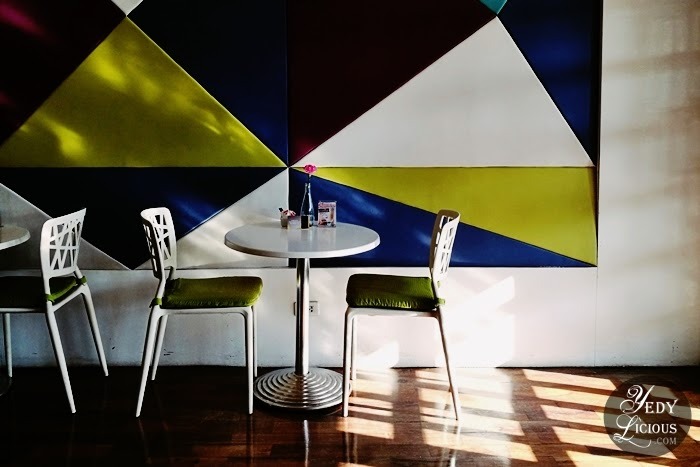 There are several benefits that guests can have if they have access to the Club Lounge. These benefits include an exclusive check-in and check-out at the Club Lounge located at the 19th floor wherein familiar and friendly staff will help you to get the most out of your stay, free non-alcoholic drinks all day which can be consume in the lounge, exclusive food set-up and perks the guests can enjoy during daily breakfast buffet, afternoon tea, and sunset cocktails. 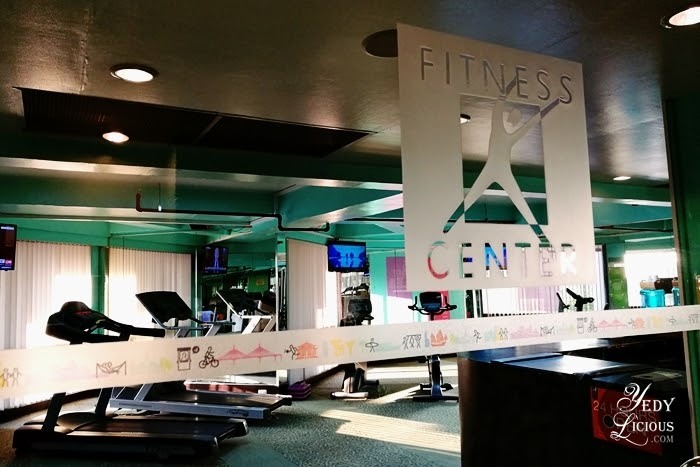 There is also a free 2-hour use of the private room that must be booked in advance, complimentary internet access, and a free one-time laser printing or photocopy of 5-pages black and white document. From 7:30pm till around 11pm, guests may enjoy a wide selection of light bites, cocktails, and wines while enjoying the amazing night views of Manila Bay at Windows by the Bay also located within the Club Lounge. 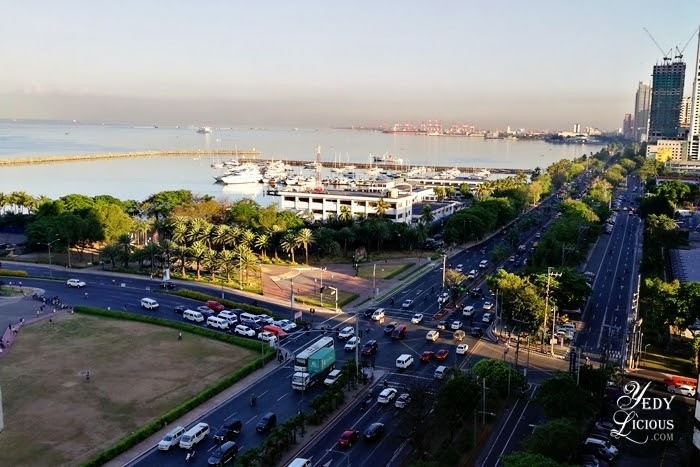 I have written about Windows by the Bay on my previous blog post which you might want to check to give you an idea what this thing that you should not missed when staying at Hotel Jen Manila. 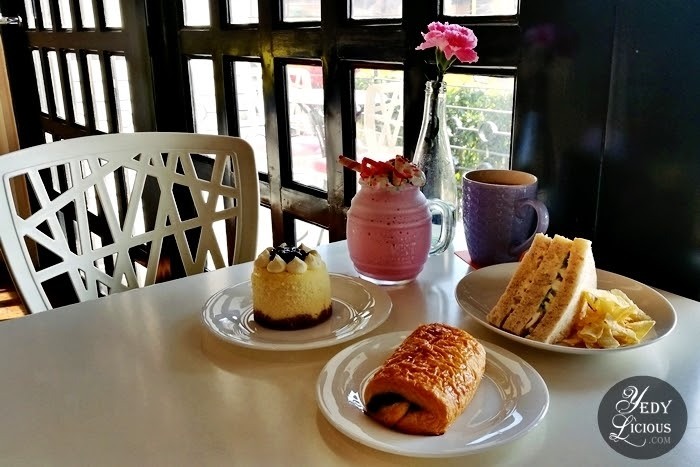 Hotel Jen Manila have several restaurants, bar, and lounges within the property which are perfect venue for guests who prefers to stay within the property but still want to enjoy great food they can enjoy while in Manila. Latitude is their all-day dining restaurant that offers themed daily buffet and ala carte menu. 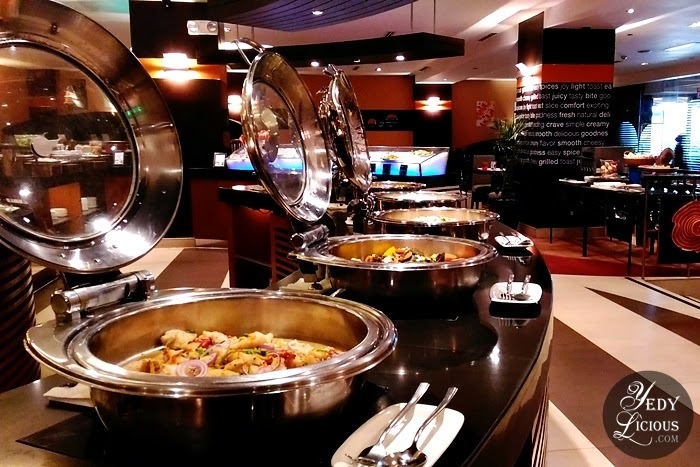 I have dined at Latitude several times already and I must say that it is one of those hotel buffets that focuses on quality instead of quantity. I love the fact that they offer themed buffet that gives variety of options for guests who dine there on a daily basis. When hankering for Japanese food, I rely on Kitsho Japanese Restaurant that offers wide variety of sushi, sashimi, tempura, and other Japanese cuisine I love. I love that it has an extensive sake selection which can be enjoyed in Kitsho’s cozy bar. There’s also Coffee.com, a coffee shop that offers good coffee and food selection and features fast and free wifi. Of course, there are also the Club Lounge, Windows by the Bay, and the Lobby Lounge which also offers great selection of drinks and food. I am aware that this lean tends to lean heavily on foodie side of the spectrum but pardon me, for I am a food blogger. 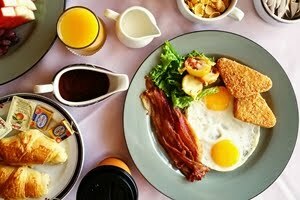 Hence, room service which I definitely enjoy while staying at Hotel Jen Manila must be included on my list. Who doesn’t love room service anyway, right? 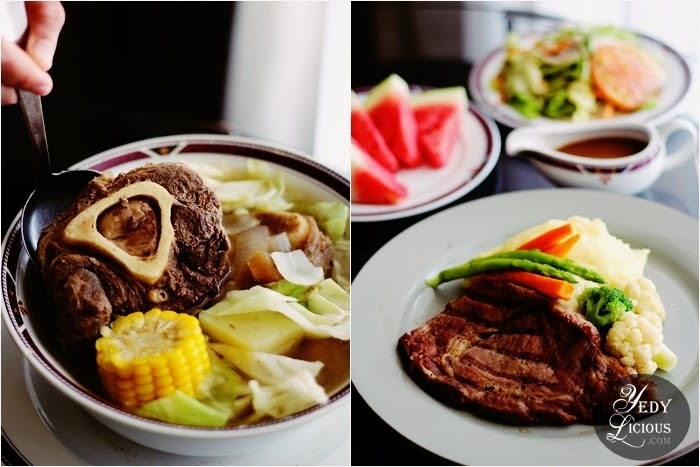 Now, while the food that they offer at the restaurants, bars, and lounges at Hotel Jen Manila are all nothing short of amazing, the selections for the in-room dining are also well worth raving about. Also, enjoying delicious food at the comfort of your own room where you don’t have to dress up is what I consider a downright delightful staycation, I tell you. I enjoyed everything we had feasted on when we order in, but those which leaves a really good impression on me were the Bulalo alla Julita which is essentially generous portion of Beef shanks in broth with oiled summer vegetables and the classic favorite, U.S. Ribeye Steak, 250 grams of manly meat served with vegetables and a choice of steamed rice, mashed potato, or baked potato for side dish and peppercorn mushroom, pan gravy, or red wine sauce. A staycation somehow gives me the right to wake up later than usual so I also enjoyed in-room dining for breakfast. 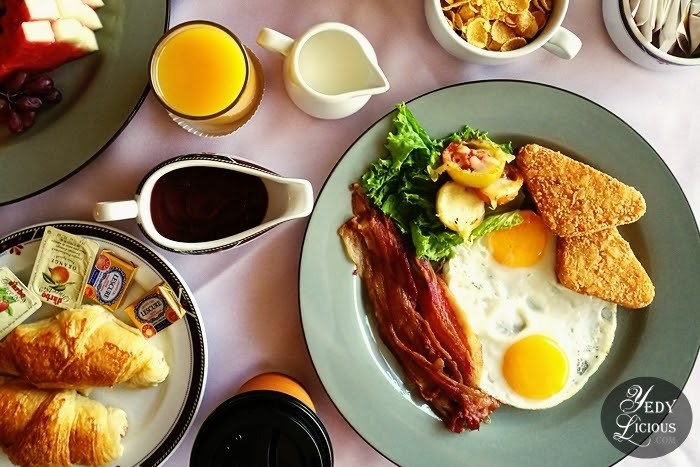 I find the American Breakfast which includes a choice between chilled fruit juice or fresh fruit, cereals, bakery basket, two eggs any style, choice of bacon, ham, sausage, or corned beef hash served with either brewed coffee, tea, or hot chocolate. Last but not the least, one of the reasons why I love staying at Hotel Jen Manila is of course, the kindly people. The staff, in all of the occasion that I have stayed in at Hotel Jen Manila are always warm, friendly, and accommodating. And if you are a long-time reader of this blog, you would know for sure that people who knows good customer service matter a lot to me. 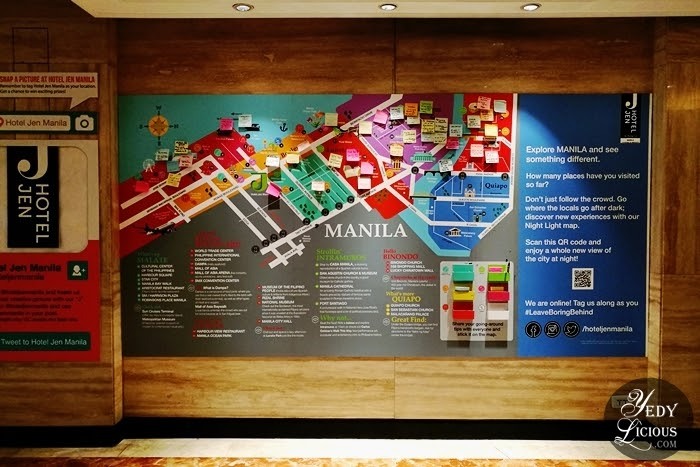 Even my parents who I was with during my recent stay were highly impressed with the kind of service that Hotel Jen Manila staff have provided us. And that for me, made every stay at Hotel Jen Manila more memorable. I know that there are several other reasons why I love staying at Hotel Jen Manila but these are just those which are on top of my head. I am aware there are several more. With these, I can say that Hotel Jen Manila is one of those hotels in Manila which I highly recommend. How about you? 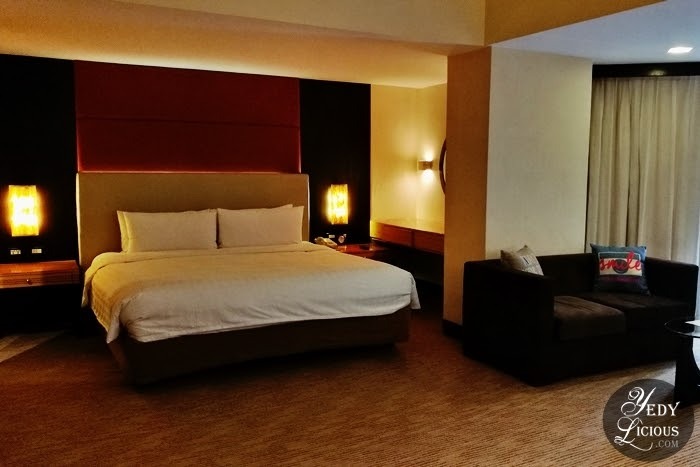 Have you stayed at Hotel Jen Manila yet? Care to add your own reasons to the list we have here?